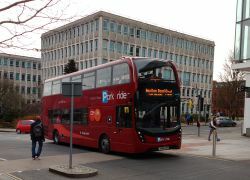 Just 100 metres from Exeter St. Davids Rail Station, this Premier Inn has bright, modern rooms with private bathrooms. Exeters centre is just 15 minutes walk away. Each room at Premier Inn Central St. Davids features a TV and a power shower and toiletries in the bathrooms. There is a work desk and a hairdryer in all rooms. Guests can dine in the stylish restaurant, serving both traditional and modern dishes. Cooked and continental buffet breakfasts are served each day. Exeter Central Station can be reached in 10 minutes on foot. 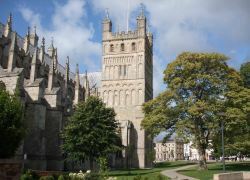 Guildhall Shopping Centre and Exeter Cathedral are both a 15-minute walk away.